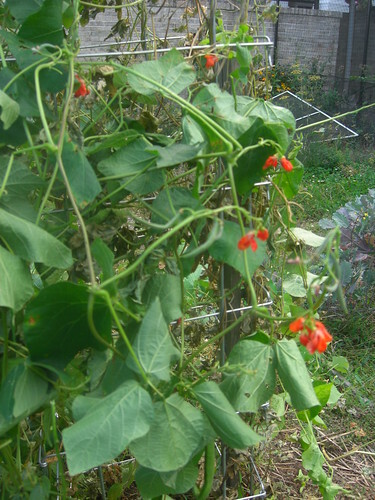 My beautiful Scarlett runner green beans. “The AmpleHarvest.org Campaign, a charitable organization enables gardeners to donate any excess produce to a local food pantry – easily found at www.AmpleHarvest.org or using the free AmpleHarvest.org iPhone app. Initially rolled out in May 2009, nearly 2,800 food pantries across all 50 states now participate with more signing up every day. AmpleHarvest.org has been working with the USDA and food banks in the Gulf region of the USA to help local food pantries meet the increased demand for assistance brought about by the BP oil spill. Gardeners who donate some of their harvest not only diminish hunger in their community; they also help to improve the environment – all without spending a dime. Share this information on your blog and with your network of friends and family across the country – especially backyard, patio and kitchen gardeners – as well as CSA (Community Supported Agriculture) members who may occasionally receive more produce than they can personally use. Share a flier http://www.ampleharvest.org/downloads/pantry.pdf with a food pantry in your community. As 70% of all food pantries are in houses of worship, reach out to your friends in the faith community to ask them to help get a pantry registered. Let the local media (print and electronic) know about the AmpleHarvest.org Campaign. Press/media information is available at http://www.ampleharvest.org/press.php. Most importantly, if you are a home gardener, please be generous with your excess harvest. You are one of 41 million gardeners in America who, garden by garden, can diminish hunger in your community. Times are tough. The AmpleHarvest.org Campaign enables people to help their neighbors in need by reaching into their backyards instead of their back pockets. One out of every six Americans is hungry. It doesn’t have to be that way. Do you have more than enough? Was this year’s harvest out of control? Would you consider or have you donated to a local food pantry or soup kitchen.